Jacob Jumpha (left) and Kondwani M’dale (right), have been interns at Never Ending Food for over a year. During this time, they have been conducting hands-on practicals, participating in community outreach, giving tours, going on site visits, and attending trainings. This week they officially received their Certificates of Permaculture Design! In October of last year, they both attended an Introduction to Permaculture course at the Permaculture Paradise Institute, facilitated by Never Ending Food‘s former Manager, Luwayo Biswick. This course was funded by the generosity of a retired Dietitian from the United States, Anne Hennessey. A huge thank you to Anne for helping to make this learning opportunity a reality! 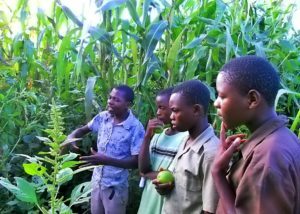 For their final project, Jacob and Kondwani were allowed to use the grounds of a 5-hectare school that is currently being built near Chitedze. This school, Kusewera, aims to empower and educate children in Malawi through activities such as sports, dance, music, art, sewing and more. Good Permaculture Design is a 3-step process: observation, mapping, and design. Jacob and Kondwani spent several weeks observing the existing structures, geographical features, natural resources, and current uses of the school. They then mapped all of these resources–to scale–to give of picture of what currently exists. The designs that they created are ideas for the future sustainable development of the school grounds, in coordination with the needs of the school. Both Jacob and Kondwani created separate designs, but both designs included ideas for water management, renewable energy, increased food and nutrition security, playground areas, eco-sanitation, and an expansion of primary/secondary/vocational school blocks. When the process was finished, the maps and designs were presented to the school staff for their consideration. 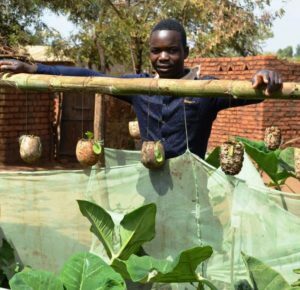 It’s wonderful to see the development of young Malawians, like Jacob and Kondwani, who can envision a sustainable future based upon the use of their Permaculture skills. 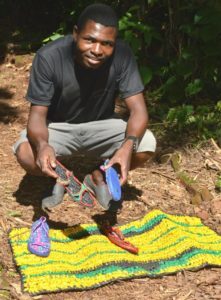 Both of them are already incredible role models in their communities, implementing Permaculture at their own homes, working with community groups, teaching groups of students, and even creating income-generating products out of recycled plastic materials. 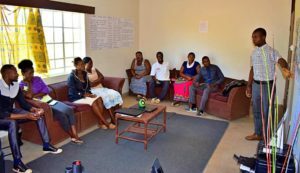 As Margaret Mead once said: “Never doubt that a small group of thoughtful, committed citizens can change the world; indeed, it’s the only thing that ever has.” We have a great deal of hope for the future when my wife and I have been in Malawi long enough to see children transforming into visionary young adults. We have personally known Jacob Jumpha since he was 15 years old, and he was already teaching people about Permaculture principles as far back as 2011. This picture was taken 8 years ago when we took children from our village to learn from Jacob about the designs that he was implementing even at that time. 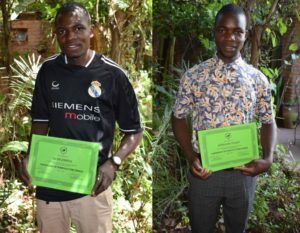 Malawi now has two new incredibly talented and committed Permaculture teachers to contribute to the nation’s future! Congratulations guys, you earned it! An Update on our Sustainable Classroom!